C’mon Common Space; which is it? Is the independence movement ‘in retreat’ or ‘re-bounding?’ Gonnae stop this inward-looking rumination and get on with attacking the Union? I wrote the above on the 21st, mystified by one Common Space writer’s apparent confusion given that the last Survation poll had support for independence clearly rebounding from 40% to 46%. Remember, only Survation correctly predicted the last General Election result. Based on current polling, Survation suggest that even a small swing to the SNP would mean Labour would lose Glasgow North East, Rutherglen and Hamilton, Kirkcaldy and Cowdenbeath, Midlothian to the SNP. The Conservatives would also lose Stirling and Gordon. 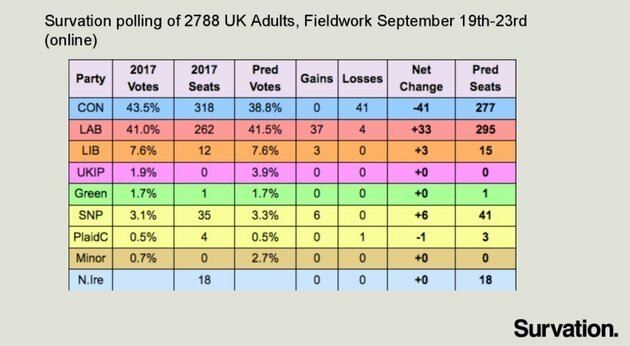 Survation put their poll’s boost for the SNP largely down to Nicola Sturgeon’s pro-remain stance which is improving the party’s prospects. I suspect Ruth’s disappearance and the Labour leadership shambles are playing a part too. Finally, with regard to independence the outcome of the Scottish Labour leadership contest seems likely to push those 24% pro-independence supporters in the Labour party firmly into the Yes camp for the next referendum. Footnote: Why is Alex Rowley not standing for Labour leader? Much more appealing to working-class Scots voters for or thinking about Yes support? Me make an arithmetical mistake? Surely not? Thanks. I’ll edit it. Alex Rowley John ? he would need a charisma transplant ! , mind you , Corbyn managed it . Rowley was speaking from the conference on Sunday and was asked about independence from Gordon Brewer a few times , he would not commit at all , saying he thought we were better in the UK .I do not think he meant it at all when he said we should be allowed another independece vote , it was just Labour trying to pinch yes votes . He once said he had never considered himself a Unionist. As for Charisma, the Thick Prince and a Kenneth Williams lookalike? We have not been hearing very much of the Colonel recently. She is obviously still around, because we saw her at FMQ and her cheerleaders in the New Statesman and Guardian are still writing approvingly and we had a leak from a new book that several people like Amber Rudd asked her to stand against ‘Strong and Stable’, but she, modestly, declined. Is she being coached and rehearsed for a ‘barnstormer’ at the Tory Conference, when, possibly, the defenestration of the honourable member for Maidenhead might happen or, at least, the window will be opened? That’d be worth watching. We haven’t had a good defenestration since Vienna in the 30s. Theresa already looks as if she’s had a fall. Here’s the scenario. The strain of working indefatigably for ‘the best possible deal’ has knocked ‘Strong and Stable’s’ diabetes out of balance and despite the pleas of her doctor, she had insisted on working on – 24 hours a day – but, she is human like the rest of us and her body has said, “No More.” So she resigns not just from PM but also from Parliament with immediate effect. A bye-election is held within the month, with a rapidly adopted candidate – THE COLONEL! When Parliament resumes, she is appointed, by acclamation, as PM. The Queen orders a week of celebration. Bells (except Big Ben) are rung all over London and up and down the country. Jeremy Corbyn resigns. The New Statesman and Guardian bring out souvenir editions. Kick boxing becomes the must-do activity of the beautiful people. The EU immediately concedes every demand. Donald Trump and President Erdogan make state visits. I am going out now. I am told it will do me good. Might be more truth to that than earlier the day. You are mad as a Hatter but, we are way down Alice’s rabbit hole for it to be impossible. And, Jacob Rees Mogg seduces her with a view to becoming Mrs PM? His nanny would never permit such a thing!